NoiseTrade Books helps authors & publishers meaningfully connect with readers through the exchange of free ebooks & audiobooks for email addresses & postal codes. Build your audience by giving away full-length ebooks, audiobooks, sample chapters, study guides, or episodic books and graphic novels. A great book is its own best marketing tool. Lead with great content, not smoke & mirrors. There’s no better way to build your tribe than by letting your writing speak for itself. Knowing who and where your readers are puts you in the driver seat. Meet your new marketing team. Join the NoiseTrade Books community and find new readers among NoiseTrade’s massive audience who are eager to discover their new favorite author. Generosity that works both ways. In addition to reader data, NoiseTrade lets readers respond to your free books in kind. Give your readers the ability to leave a tip if they like what they read. Readers tell friends, who tell their friends (and so on). Great books don’t stay a secret for long. NoiseTrade makes it easy for readers to tell all of their friends about you. Ready to meet over a hundred thousand new readers? We can make an introduction. With NoiseTrade Books’ highly engaged tribe of over 100,000, a feature in one of our weekly emails can really move the needle. You (and your readers) can give your books away everywhere online with NoiseTrade’s easily embeddable widget. TUNNEL UNDER RETAILERS TO CONNECT DIRECTLY WITH YOUR FANBASE. No matter the device, NoiseTrade is there. With the responsiveness of NoiseTrade’s platform, your readers have a great experience no matter where they find you. 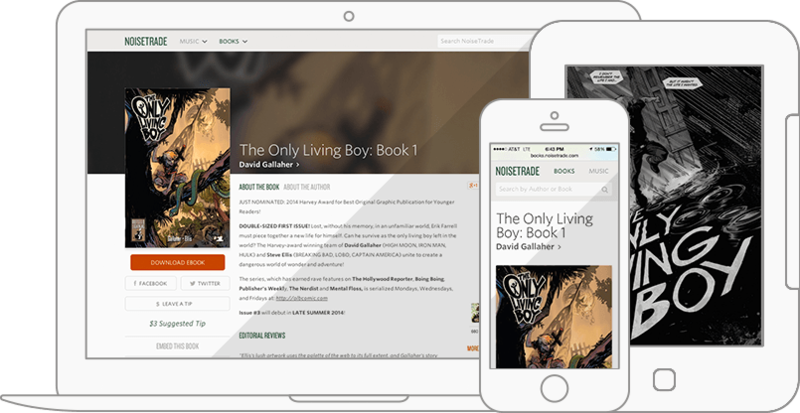 With the ability to deliver any PDF, ePub, MOBI, or audiobook files, from desktop to mobile we’ve got you covered. WHETHER YOU’RE A SELF-PUBLISHED AUTHOR OR A MAJOR PUBLISHER, NOISETRADE IS THE BEST WAY TO BUILD YOUR TRIBE AND TURN CASUAL READERS INTO CUSTOMERS (WITHOUT SUBSCRIPTION FEES OR HARMING TREES).